SQL, which is short for Structured Query Language, is a standard computer programming language used for retrieving and managing records in databases. It was developed by IBM in the early 1970s, patented in 1985, and formally standardized in 1986 by the American National Standards Institute (ANSI) and by the International Organization for Standardization (ISO) in 1987. Unlike other programming languages like Basic or C, which are imperative languages, SQL was developed as a set-based declarative query language. Variations of SQL were later created, in which procedural constructs, flow of control statements, user-defined data types, and several other language extensions were also added. The SQL language is subdivided into different language elements – clauses (basic statement and query components), expressions (these produce scalar values and tables consisting of rows and columns), predicates (these set conditions for evaluation of values, limit statement and query effects, and change program flow), queries (to retrieve data on specific specifications), and statements (these control the different transactions). All these elements put together form the SQL language and have made it a favorite language for database management as it can perform many different tasks. These include creating new databases; creating new tables, views, and stored procedures in the databases; inserting records or data; retrieving data from tables or databases; updating or deleting data from the databases; and setting permissions on tables, procedures, and views. It can also perform different calculations before showing the results. Despite all these advantages, SQL also has some drawbacks. Chief among these is the lack of cross-platform compatibility. This means that SQL files cannot be ported between database systems, unless certain modifications are made. Other disadvantages include complex and ambiguous language grammar and semantics, and improper handling of missing data. SQL files can be read with Microsoft Access on Windows; FileMaker Pro on Windows and Mac OS; MySQL on Linux; or a text editor on Windows and Mac OS. If you want to convert sql spreadsheets to other formats (like PDF, DOC, HTML, LATEX, etc.) 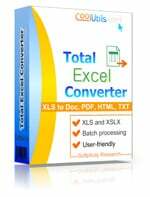 use Total Excel Converter.